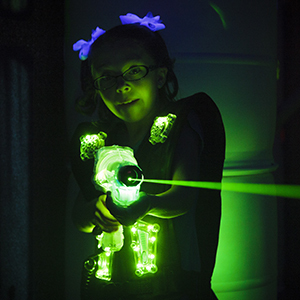 Great for ages 6 and up, Laser Tag is a sure-fire hit with the kids. 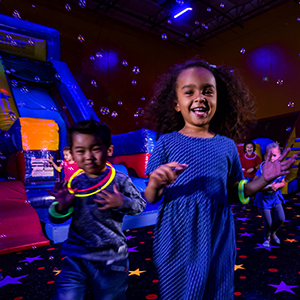 It can be played with the lights on, or in addition to our popular Glow experience. The game lasts about 15 minutes, or longer if you like. Parents can play as well! Kids love bubbles, and we'll give them thousands! 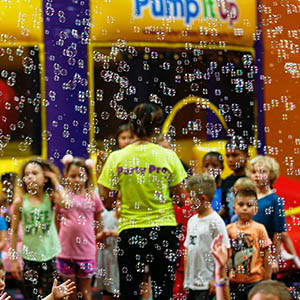 We'll do three separate bubble blasts during your jump time in the second play arena. Highly recommended for ages 6 and under. Add glow to any party! Includes one glow necklace per child and a special LED wand for the birthday child. Glow is included as a free upgrade in our Late Night Parties. A great gift for your guests. 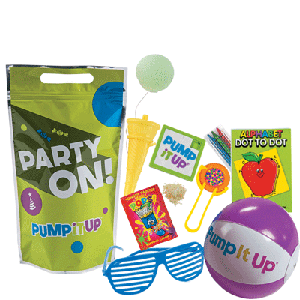 Each bag contains an activity book and crayons, slide puzzle, ice cream cone shooter, cool shades, a beach ball and tongue painter candy. 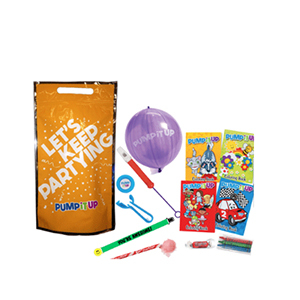 A great activity bag that includes a coloring book, crayons, punch ball, slide flute, disc shooter, and candy (pixie stick and frootie).